For other uses, see Grimsby (disambiguation). "Great Grimsby" redirects here. For the parliamentary constituency, see Great Grimsby (UK Parliament constituency). Grimsby, also Great Grimsby, is a large coastal English seaport and administrative centre in North East Lincolnshire, on the South Bank of the Humber Estuary, close to where it reaches the North Sea. It ran the largest fishing fleet in the world by the mid-20th century, but fishing declined dramatically after the Cod Wars denied UK access to Icelandic fishing grounds, and the European Union parcelled out fishing quotas in waters within a 200-mile limit of the UK coast to other European countries, in line with its Common Fisheries Policy. Since then Grimsby has suffered post-industrial decline, although food manufacturing has been encouraged since the 1990s. The Grimsby–Cleethorpes conurbation acts as a cultural, shopping and industrial centre for much of northern and eastern Lincolnshire. Grimsby people are called Grimbarians; the term codhead is also used jokingly, often for Grimsby football supporters. Great Grimsby Day is 22 January. The town was titled "Great Grimsby" to distinguish it from Little Grimsby, a village about 14 miles (22 km) to the south, near Louth. The town had a population of 88,243 in 2011. It is physically linked to and forms a conurbation with the adjoining town of Cleethorpes. Some 11,000 of its residents live in the village of Scartho, which was absorbed into Grimsby before 20th-century laws on the green belt were passed. All three areas come under the jurisdiction of the same unitary authority, North East Lincolnshire. It is close to the main terminus of the A180, which ends in Cleethorpes. Grimsby lies in the national character areas of the Humber, and the Lincolnshire coast and Marshes; it is predominantly low in topography. The town was historically settled on low-lying islands and raised areas of the Humber marsh, and subsequently expanded onto the surrounding marshes as they were drained. The town still has areas named East Marsh and West Marsh. The Lincolnshire Wolds are situated to the south west of the town, from which the town's River Freshney rises. There is some archaeological evidence of a small town of Roman workers sited in the area in the second century. Located on the River Haven, which flowed into the Humber, this provided an ideal location for ships to shelter from approaching storms. It was also well situated to exploit the rich fishing grounds in the North Sea. Grimsby was settled by Danes sometime in the 9th century AD. According to legend, the name Grimsby derives from the name Grim, a Danish fisherman, the suffix -by being the Old Norse word for village. The legendary founding of Grimsby is described in Lay of Havelock the Dane, but historians consider this account to be myth. In Norse mythology, Grim (Mask) and Grimnir (Masked One) are names adopted by the deity Odin (Anglo-Saxon Woden) when travelling incognito amongst mortals, as in the short poem known as 'Grimnir's Sayings' (Grimnismal) in the Poetic Edda. The intended audience of the Havelock tale (recorded much later in the form of The Lay of Havelock the Dane) may have understood the fisherman Grim to be Odin in disguise. The Odinic name 'Grimr/Grim' occurs in many English placenames within the historical Danelaw and elsewhere in Britain, examples being the numerous earthworks named Grimsdyke. As other British placenames containing the element Grim are explained as referring to Woden/Odin (e.g. Grimsbury, Grimspound, Grime's Graves, Grimsditch, Grimsworne), Grimsby is likely to have the same derivation. Grimsby is listed in the Domesday Book as having a population of around 200, a priest, a mill and a ferry. During the 12th century, Grimsby developed into a fishing and trading port, at one point ranking twelfth in importance to the Crown in terms of tax revenue. The town was granted its charter by King John in 1201. The first mayor was installed in 1202.
saurs vara vant, er várum, viðr, í Grímsbœ miðjum. branda elg á bylgjur Bjǫrgynjar til dynja. there was no lack of mud where we were, in the middle of Grimsby. on the waves over the seagull's swamp [sea] to Bergen. Grimsby does not have town walls. It was too small and was protected by the marshy land around it. However, the town did have a ditch. In medieval times, Grimsby had two parish churches, St Mary's and St James. Only St James, now known as Grimsby Minster, remains. St James is associated with a folk tale of an Imp who played tricks in the church and was turned into stone by an angel (a similar story is told for Lincoln Cathedral; see Lincoln Imp). In the mid-14th century, the town benefited from the generosity of Edmund de Grimsby, a local man who became a senior Crown official and judge in Ireland. In the 15th century, The Haven began to silt up, preventing ships in the Humber from docking. As a result, Grimsby entered a long period of decline which lasted until the late 18th century. By 1801, the population of Grimsby numbered 1,524, around the same size that it had been in the Middle Ages. The Grimsby Haven Company was formed by Act of Parliament in May 1796 (the Grimsby Haven Act) for the purpose of "widening, deepening, enlarging, altering and improving the Haven of the Town and Port of Great Grimsby". After dredging of The Haven and related improvement, in the early 19th century the town grew rapidly as the port was revived. Grimsby's port boomed, importing iron, timber, wheat, hemp and flax. New docks were needed to cope with the expansion. The Grimsby Docks Act of 1845 allowed the necessary building works. The arrival of the railway in 1848 made it easier to transport goods to and from the port to markets and farms. Coal mined in the South Yorkshire coal fields was brought by rail and exported through Grimsby. Rail links direct to London and the Billingsgate Fish Market allowed for fresh 'Grimsby Fish' to gain renown nationwide. The first true fish dock opened in Grimsby in 1856, and the town became a centre for the development of the commercial fishing industry. The Dock Tower was completed in 1851, followed by the Royal Dock in 1852. No.1 Fish Dock was completed in 1856, followed by No.2 Fish Dock in 1877. Alexandra Dock and Union Dock were completed in 1879. During this period, the fishing fleet was greatly expanded. In a rare reversal of the usual trends, large numbers of fishermen from the South-East and Devon travelled North to join the Grimsby fleet. Over 40% of these newcomers came from Barking in East London, and other Thames-side towns. In 1857 there were 22 vessels in Grimsby. Six years later there were 112. The first two legitimate steam trawlers ever built in Great Britain were based in Grimsby. By 1900, a tenth of the fish consumed in the United Kingdom was landed at Grimsby, despite the many smaller coastal fishing ports and villages that also supplied the nation. The demand for fish in Grimsby grew to such an extent that, at its peak in the 1950s, Grimsby laid claim to the title of the largest fishing port in the world. The population grew from 75,000 in 1901 to 92,000 by 1931. But the Great Depression and the restructuring of the fishing industry caused a severe decline in employment. The population was fairly stable for the rest of the 20th century. The Royal Dock was used as the UK's largest base for minesweepers to patrol the North Sea. The Admiralty requisitioned numerous trawlers to serve as minesweepers for the Royal Naval Patrol Service. In many cases, their crew were ex-trawlermen, as well as men from the Royal Naval Reserve and Royal Navy volunteers. Trawlers would use the winches and warps from fishing operations to tow a paravane with a cutting jaw through the water in what was known as a 'sweep' to bring mines to the surface and allow for their removal. The dangers faced by the 'Patrol Service' ensured that it lost more vessels than any other branch of the Royal Navy during the Second World War, with 2,385 lives lost. Grimsby’s Royal Naval Patrol Service veterans financed the construction of a memorial beside the Dock Tower to ensure that the bravery and sacrifice of their comrades is never forgotten. On 14 June 1943, an early-morning air raid by the Luftwaffe dropped several 1,000 kg bombs, 6,000 incendiary bombs and more than 3,000 Butterfly Bombs in the Grimsby area. Ninety-nine people died that night and in total, Second World War bombing raids in Grimsby and Cleethorpes killed a total of 196 persons. In addition 184 people were seriously injured. The Butterfly Bombs, which littered the area, hampered fire-fighting crews trying to reach locations damaged by the incendiary bombs. The search for recovery of bodies continued for a month after the raid. HMS Grimsby is a Sandown class minehunter (commissioned in 1999) currently in service in the Royal Navy. Following the pressures placed on the industry during the Cod Wars, and the European Union's Common Fisheries Policy which distributes fishing quotas from what would have been British waters to other EU nations, many Grimsby firms decided to cease trawling operations from the town. The sudden demise of the Grimsby fishing industry brought an end to a way of life and community that had lasted for generations. The loss of the fishing industry brought severe social problems to the town, in a similar manner to that seen in the coalfields following the decline of mining. Huge numbers of men became redundant, highly skilled in jobs that no longer existed, and they struggled to find work ashore. As with the Ross Group, some firms concentrated on expanding industries within the town, such as food processing. Grimsby's trawling days are remembered through the artefacts and permanent exhibits at the town's Fishing Heritage Centre. The preserved 1950s trawler, Ross Tiger, is located here. Few fishing vessels still operate from Grimsby's docks, but the town maintains a substantial fish market important in Europe. Grimsby was struck by an F1/T3 tornado on 23 November 1981, as part of the record-breaking nationwide tornado outbreak on that day. Since the mid-1980s, the former Humber ferry, PS Lincoln Castle, has been moored in Alexandra Dock. She was used during this time as a pub\restaurant. Although her design and status as Britain's last coal-fired paddle steamer was unique, these operations no longer yielded a profit. The ship was broken up in 2010. Berthed in the Alexandra Dock is the Ross Tiger, the last survivor of what was once the world's largest fleet of sidewinder trawlers. The town was described in The Daily Telegraph in 2001 as a town "subjected to...many crude developments over the past 30-odd years" and as a town which "seemingly shuns the notion of heritage". Redevelopment was planned as part of Yorkshire Forward's Renaissance Towns Programme; however, Yorkshire Forward was abolished in 2012. In the early part of the 21st century, the town faced the challenges of a post-industrial economy that was also affected by a decline in the fishing industry: the East Marsh ward of the town is the second most deprived in the country, according to the governmental statistics. Offshore windfarm support vessels in Grimsby fish dock, with Ross House in background. Since May 2015 Melanie Onn (Labour) has been the Member of Parliament for the Great Grimsby constituency. Previously, veteran MP Austin Mitchell held the seat between 1977 and 2015. 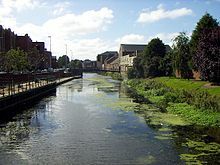 Great Grimsby formed an ancient Borough in the North Riding of Lindsey. It was reformed by the Municipal Corporations Act 1835 and became a Municipal Borough in that year. In 1889 a County Council was created for Lindsey, but Great Grimsby was outside its area of control and formed an independent County Borough in 1891. The Borough expanded to absorb the adjacent hamlet of Wellow (1889), also the neighbouring parishes of Clee-with-Weelsby (1889), Little Coates (1928), Scartho (1928), Weelsby (1928) and Great Coates (1968). It had its own police force until 1967 when it merged with the Lincolnshire force. In 1974, the County Borough was abolished and Great Grimsby was reconstituted (with the same boundaries) as the Grimsby non-metropolitan district in the new county of Humberside by the Local Government Act 1972. The district was renamed Great Grimsby in 1979. In the early 1990s, local government in the area came under the review of the Local Government Commission for England and Humberside was abolished in 1996. The former area of the Great Grimsby district merged with that of Cleethorpes to form the unitary authority of North East Lincolnshire. The town does not have its own town council, instead there is a board of Charter Trustees. During 2007, in the struggle for identity, it was suggested that the district could be renamed to Great Grimsby and Cleethorpes to give a stronger indication of its towns. This did not meet with favour among local residents, and the Council Leader dropped the idea a year later. The main sectors of the Grimsby economy are ports and logistics; and food processing, specifically frozen foods and fish processing, chemicals and process industries and digital media. To the east Cleethorpes has a tourist industry, and to the west, along the Humber bank to Immingham, is large-scale industrial activity, established from the 1950s onwards, focused on chemicals, and more recently (1990s) gas power electrical generation. The Grimsby Ice Factory was built in 1900 to provide crushed ice for ships to keep stored fish cold. Grimsby is strongly linked with the sea fishing industry, which once generated wealth for the town. At its peak in the 1950s, it was the largest and busiest fishing port in the world. As a result of the Cod Wars with Iceland, this industry has been in decline for many years. In 1970 around 400 trawlers were based in the port, by 2013 only 5 trawlers remain based there. By comparison, 15 vessels are used to maintain offshore wind farms in the North Sea. The town still has the largest fish market in the UK, but most of what is sold is now brought overland from other ports or Iceland via containerisation. Of the 18,000 tonnes of fresh fish sold in Grimsby fish market in 2012, almost 13,000 tonnes, mainly cod and haddock, came from Iceland. Today, Greater Grimsby is home to around 500 food-related companies, giving it one of the largest concentrations of food manufacturing, research, storage, and distribution in Europe. The local council has promoted Grimsby as Europe's Food Town for nearly twenty years. In 1999, the BBC reported that more pizzas were produced in the town than anywhere else in Europe, including Italy. Grimsby is recognised as the main centre of the UK fish-processing industry; 70% of the UK's fish processing industry is located there. In recent years, this expertise has led to diversification into all forms of frozen and chilled foods. The town is one of the largest centres of fish processing in Europe. More than 100 local companies are involved in fresh and frozen fish production, the largest of which is the Findus Group (see Lion Capital LLP), comprising Young's Seafood and Findus. Its corporate headquarters are in the town. Young's is a major employer in the area, with some 2,500 people based at its headquarters. From this base, Young’s has a global sourcing operation supplying 60 species from 30 countries. Traditional Grimsby smoked fish has been awarded a Protected Geographical Indication (PGI) in 2009 by the European Union. The traditional process uses overnight cold smoking using sawdust in tall chimneys, roughly 1 by 2 metres (3 ft 3 in by 6 ft 7 in) square and 10m high. Other major seafood companies include the Icelandic-owned Coldwater Seafood, employing more than 700 people across its sites in Grimsby; and Five Star Fish, a supplier of fish products to the UK food service market. The £5.6 million Humber Seafood Institute, the first of its kind in the UK, opened in 2008. Backed by Yorkshire Forward, North East Lincolnshire Council, and the European Regional Development Fund, the HSI is managed by the local council. Tenants include the Seafish Industry Authority and Grimsby Institute and University Centre. Greater Grimsby is a European centre of excellence in the production of chilled prepared meals, and the area has the largest concentration of cold-storage facilities in Europe. 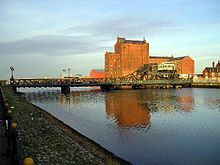 The Port of Grimsby has been in use since the medieval period. The first enclosed dock, later known as the Old Dock, was built in the 1790s by the Grimsby Haven Company. Major expansion came with the coming of the railways, and construction of the Royal Dock, Grimsby in the 1840s. A Fish Dock was added in 1857, and the fish docks expanded over the next 80 years, with Grimsby becoming a major fishing centre. The Old dock was expanded to form Alexandra Dock in the 1880s. Fishing activities were reduced to a fraction of former levels in the second half of the twentieth century. The current port is a centre for car import (and export). Since 1975, it handles general cargo. In the early 21st century, it has developed as a wind farm maintenance base. High street shopping in the town is focused on central Grimsby between the railway and River Freshney, where Victoria Street acts as a central pedestrianised shopping street with the undercover Freshney Place shopping centre to the north. Freshney Place is visited by 14 million shoppers a year and employs over 2,000 staff. The centre houses over 100 stores, including Marks and Spencer and House of Fraser. Constructed between 1967 and 1971 in a joint venture between the old Grimsby Borough Council and developers Hammerson's UK Ltd., it was known as the Riverhead Centre (so named as the development was adjacent to where the two local rivers, the Freshney and the Haven, meet). Hammerson's UK Ltd began a £100 million redevelopment of the retail centre, doubling it in size. The expanded centre was covered in a glass roof. Two multi-storey car parks were constructed at each end of the centre; with this development, the old Top Town area of Grimsby was effectively privatised and roofed over. Stores are serviced at the first floor by ramps at the western end, which can accommodate even large vehicles. The ramp also provides access to the car park on the roof of the indoor market, which is operated by the local council. Freshney Place won a design commendation in the Refurbishment Category of the 1993 BCSC awards. In the town centre Bethlehem and Osborne Street are also of mixed use, hosting retail, legal and service functions to the south of Victoria Street. Numerous local, independent stores operate in town, several at the Abbeygate Centre (off Bethlehem Street). Formerly the head office of local brewers, Hewitt Brothers, the building was renovated in the mid-1980s and is home to a number of restaurants and designer clothing stores. The town also has two markets, one next to Freshney Place and the other in Freeman Street (B1213). This was a dominant shopping area with close connections to the docks, but industry and demographic changes have caused it to struggle since the late 1970s. Previously the town centre area was rivalled by the Freeman Street shopping area, located closer to the docks. Freeman Street retains its covered market. Grimsby town centre has re-emerged in prominence as the docks declined and shops such as Marks and Spencer relocated to central Grimsby. Other developments near the town centre since the 1980s include the Alexandra Retail Park and Sainsbury's to the west of Alexandra Dock, an Asda store between the town centre and Freeman Street, the Victoria Mills Retail Park off the Peaks Parkway A16, which is home to several chain stores, including Next and close to a Tesco Extra (the second in the area). B&Q opened a large store off the Peaks Parkway to the east of the town centre Depot. Unlike many towns where shopping has been built on the outskirts, these (and similar developments) were constructed in and around Grimsby's town centre. This keeps shopping in a compact area, making it easier for pedestrians and public transport users. Some out of town development has taken place with Morrisons constructing a store located just outside the town boundary, in the parish of Laceby. It is known as Morrisons Cleethorpes. This anomalous name is derived from the period when the area was part of the now defunct Cleethorpes Borough. Most major supermarkets have expanded in the early 21st century, including Asda, and Tesco at Hewitts Circus (this store is technically in the adjoining town, Cleethorpes). Such is the quality of shopping in the area that bus services bring in shoppers from across Lincolnshire, especially from smaller towns such as Louth, Brigg, and Scunthorpe. Grimsby is beginning to develop as a renewable energy centre, and generates more electricity from solar, wind, biomass and landfill gas than anywhere else in England. The town makes 28 per cent of the electricity it uses from green sources. Its proximity to the biggest cluster of offshore wind farms in Europe, have brought around 1,500 jobs to the area, most of these are in turbine maintenance. There are numerous primary schools in Grimsby. Secondary schools in Grimsby include Havelock Academy, Oasis Academy Wintringham and Ormiston Maritime Academy. Many pupils from the town also attend secondary education institutions in Cleethorpes, Healing, Humberston and Waltham, and further afield Caistor Grammar. Independent schools in Grimsby include St James' School and St Martin's Preparatory School. Franklin College is a sixth form college located in Grimsby. While the Grimsby Institute offers further and higher education courses mostly for vocational courses, the Institute also achieves respectable examination results at all levels of adult education. The Institute has over recent years attracted a sizeable number of Chinese students to study business studies courses. 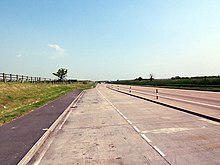 Grimsby lies 15 miles from the nearest motorway, the M180 which continues as the A180 into the town and acts as a link to the national motorway network. The transport infrastructure was described as strong, and having helped Grimsby transition to a food processing centre in a report by the European Commission. Though derided as "on the road to nowhere" by the writer and critic A. A. Gill. The town is skirted by the A18, with the A46 passing through the town providing a connection towards Lincoln, and the A16 linking the town to Louth and south and eastern Lincolnshire. New bus provision in Grimsby known by some as the "Multicoloured stop swap" with Riverhead Exchange "Superstop" right. Grimsby's bus service is provided by Stagecoach which took over the original Grimsby-Cleethorpes Transport in 1993. Grimsby-Cleethorpes Transport had been formed in 1957, with the merger of the previously separate Grimsby and Cleethorpes transport (GCT) undertakings. Stagecoach had all the buses resprayed to their standard livery to replace the buses previous colour-scheme of orange and white. Prior to this, the buses were painted blue and white until 1981, when the colours were changed to caramel and cream. The orange and white livery was introduced in 1987. Until 1982 GCT ran a mixture of crewed and one-person operated services. However, in that year the job of conductor was abolished and the company changed entirely to driver-only services. In 2005, Stagecoach bought out Lincolnshire Road Car, which provided buses to South Killingholme, Louth, Barton-upon-Humber and the Willows Estate. The company is now known as Stagecoach in Lincolnshire. Joint ticketing was allowed with Stagecoach Grimsby-Cleethorpes from May 2006. From September 2006, a new fleet of low-floor single-deckers was introduced, making the fleet an unprecedented 85 per cent low-floor. Grimsby also has rail links via Grimsby Town railway station and Grimsby Docks railway station. There is a level crossing in the centre of the town across Wellowgate. TransPennine Express provide direct trains to Manchester Airport via Doncaster and Sheffield whilst Northern operate services to Barton-upon-Humber (for buses to Hull) and a Saturday only service to Sheffield via Retford. Lincoln and Newark are served by East Midlands Trains services which can go on to Nottingham on Sunday in the summer months. The service to Cleethorpes runs at least hourly during the day, along a single track, passing stations at Grimsby Docks and New Clee. The Grimsby Light Railway opened in 1881 using horse-drawn trams. In 1901, these were replaced with electric tramways. In 1925 the Grimsby Transport Company bought the tramway company and in 1927 moved the depot to the Victoria Street Depot, an old sea plane hangar. This system closed in 1937. The depot continues to be used by Stagecoach, though the old Grimsby Tramways livery is still visible on the front of the building. 14 miles (23 km) west of Grimsby is Humberside Airport, which mainly caters for charter holidays, and is popular for general aviation, with five flying clubs based there. The local football team is Grimsby Town F.C., nicknamed The Mariners, who as of the 2016–17 season play in Football League Two. Their ground is Blundell Park in Cleethorpes and it is often joked by locals that it is the only British club to play away every game. It is the oldest professional football team in the county of Lincolnshire and one of the oldest in the country, being formed in 1878 as Grimsby Pelham with a home ground on land off Ainslie Street, Grimsby. During the 1930s Grimsby Town played in the English First Division, then the highest level of the domestic game in England. It also appeared in two FA Cup semi-finals in the 1930s: in 1936 (against Arsenal) and in 1939 (against Wolverhampton Wanderers). The latter semi-final was held at Old Trafford, Manchester, and the attendance (76,962) is still a record for the stadium. Grimsby Town were relegated on 7 May 2010 to the Football Conference, losing their status as a League club. It returned to the Football League after gaining promotion via the National League play-off final in 2016, beating Forest Green Rovers 3–1 at Wembley Stadium. The team reached the FA Cup quarter-finals in 1987 and in 1998 won the Auto Windscreens Shield and the second division play-off final. Notable former managers include Bill Shankly, Lawrie McMenemy and Alan Buckley. Blundell Park has the oldest stand in English professional football, the Main Stand. It was first opened in 1899, although only the present foundations date from this time. There have been plans to relocate the club to a new stadium, including one at the side of Peaks Parkway in Grimsby. Grimsby Borough F.C. is a football club established in 2003 and based in Grimsby. It belongs to the Northern Counties East League Division One. Cleethorpes Town F.C. plays in Grimsby, where it has a ground share with Borough of the Bradley Development Centre. An ice hockey club has been based in Grimsby since 1936. The current club has teams playing at different levels throughout the English Ice Hockey Association structure, all under the name of the Grimsby Red Wings. In 2009 the club added an ice sledge Hockey team to ensure that it was able to offer a fully inclusive sport to the NE Lincolnshire area. The area has an amateur Rugby Union side, the Grimsby RUFC, and an amateur cricket side, the Grimsby Town Cricket Club, both of which attract reasonable levels of support. The Grimsby Scorpions American Football team operated until 2014 before relocating to Hull where they merged with Hull's team to form the Humber Warhawks. 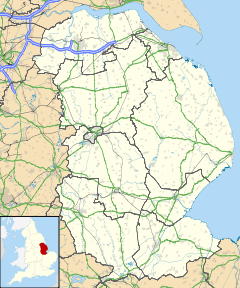 Despite playing in another county the club maintain representation of both East Yorkshire and North East Lincolnshire. Tennis teams from local clubs have been successful in various inter-County competitions with the Men's Team from Grimsby Tennis Centre winning the Lincolnshire Doubles League again in 2005. Tennis players from the town represent the County on a regular basis at all age levels. Grimsby Tennis Centre underwent a major redevelopment of facilities in 2005 and is now entirely accessible to the disabled. The town had one of the largest table tennis leagues in the country with over 120 teams competing during the 1970s, but, like the game of squash, the sport has declined in the town during recent years. Aside from the nightclubs in nearby Cleethorpes, the town centre has undergone a renaissance in the last decade.[when?] A number of national pub chains have redeveloped or opened new outlets, including a specially-built complex at the Riverhead which is home to three (originally five) such operations. [needs update] Prior to the late 1960s many public houses in the area were owned by the local brewer Hewitt Brothers and gave a distinctive local touch but following a takeover in 1969 by the brewer Bass-Charrington these have been re-badged (many times), closed or sold off. Musical entertainment is found at the Grimsby Auditorium, built in 1995, on Cromwell Road in Yarborough near Grimsby Leisure Centre. 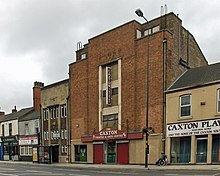 The smaller Caxton Theatre is on Cleethorpe Road (A180) in East Marsh near the docks. The Caxton Theatre provides entertainment by adults and youths in theatre. A notable theatre company in the area is the Class Act Theatre Company run by local playwright David Wrightam. North East Lincolnshire Council has installed a Wi-Fi network covering Victoria Street in central Grimsby. The service provides access to the Internet for the general public on a yearly subscription. Grimsby's former cinema on Freeman Street closed in 2004, with the Parkway cinema in nearby Cleethorpes serving the town. Plans to build a new cinema in the town have been periodically made since. The Whitgift Film Theatre based in John Whitgift Academy shows a programme of limited release and art house films. Grimsby is the site of a Blue Cross Animal Hospital, one of only four in the country; the other three are situated in London. The Grimsby hospital was previously in Cleethorpe Road, but in 2005 it moved to a new building called 'Coco Markus House' in Nelson Street. The Grimsby Telegraph, with an audited circulation of 40,533 copies (January – June 2004), has the highest circulation of a local newspaper in Grimsby and the surrounding area since it is the only daily newspaper. Its former headquarters are on Cleethorpe Road next to the A180, it is now based in Heritage House near to the Fishing Heritage Centre. The local radio stations are BBC Radio Humberside (which has a studio on Victoria Street manned by Lara King), Lincs FM, Viking FM and the exclusively North East Lincolnshire-based Compass FM. The transmitter for Compass FM and EMAP Humberside (Lincs FM DAB) is on top of a block of flats in East Marsh. Terrestrial television coverage based in the area are the BBC who share the radio facilities on Victoria Street and ITV Yorkshire who have a news unit based in Immingham. Estuary TV (formerly Channel 7 Television) broadcast on Freeview channel 8 and on Virgin Media channel 159 from studios based at the Grimsby Institute. Bernie Taupin, who lived in Humberston and Tealby (near Market Rasen) when in his teens, wrote the lyrics to Elton John's 1974 song, "Grimsby", which is included in John's album Caribou. The town has been used as a film location: Scartho Hospital (now Diana, Princess of Wales Hospital), and the Scartho Cemetery entrance, were used in the 1985 film Clockwise; the 2006 film, This Is England was partially set and filmed in Grimsby and other surrounding locations such as Nottingham; as was the television serial sequel, This is England 86, set in 1986..
Brothers Grimsby is a 2016 comedy film starring Sacha Baron Cohen and Mark Strong. It was released by Columbia Pictures in February 2016. No scenes for the film were shot in Grimsby, with scenes of the town filmed in Tilbury, Essex. The town was the setting for the second series of the Channel 4 documentary Skint in 2014. The programme follows families and individuals living with the "devastating effects of long-term unemployment". The Environment Agency has awarded Sheffield-based telemetry company CSE Seprol a contract to supply flood warning devices for risk areas in East Anglia. The 18 sirens, at various locations around the flood risk area of Grimsby and Cleethorpes, should reach 25,500 households to warn of portending floods. The sirens will be sounded only in the event of the Environment Agency issuing a severe flood warning for tidal flooding, or if there is a likelihood of the sea defences being breached. The sirens make a variety of sounds, from the traditional wailing sound to a voice message. Quentin Cooper, presenter of Radio 4's Material World and film correspondent for BBC Radio 2, grew up in the town, attending Wintringham School. Patrick Cormack (born 1939), Conservative politician and MP, later the life peer Baron Cormack. Arthur Drewry (1891–1961), football administrator and businessman, was the chairman of Grimsby Town F.C., and later President of the Football League, Chairman of the Football Association, and President of FIFA. Edmund de Grimsby, judge and clergyman, was born in Grimsby and probably died here in 1354. Dan Haigh (born 1981), bass guitarist in rock group Fightstar, and co-founder of synth-wave trio Gunship (band), was born and brought up in the town. Patricia Hodge (born 1946), actor: Miranda, Rumpole of the Bailey and Jemima Shore Investigates. Her parents managed the Royal Hotel in the town. She attended Wintringham School. Ian Huntley (born 1974), Soham double child murderer, was born at Grimsby and lived there until the late 1990s. Madge Kendal (1848–1935), theatrical actor. Dame Kendal Grove, in Nunsthorpe, is named after her. Matt Kennard (born 1982), television actor, best known for starring in the UK daytime drama Doctors, as nurse Archie Hallam. Amy Monkhouse (born 1979) lawn bowler. Julie Peasgood (born 1956), actor, Fran in the soap opera Brookside, grew up in Grimsby and attended Wintringham School. Thomas Turgoose (born 1992), actor notably in This is England. Patrick Wymark (1926–1970), actor. Wymark View was named after him. Harold Gosney (born 1937), artist and sculptor, taught at Grimsby School of Art 1960-92 and created many sculptures sited around Grimsby. John Hurt (1940–2017), actor, spent his formative years in the town while his father was minister at St Aidan's, Cleethorpes. Norman Lamont (born 1942), Conservative MP and former Chancellor of the Exchequer, was brought up in the town. David Ross – businessman, co-founder of Carphone Warehouse was brought up in the town. Ernest Worrall (1898–1972), painter known for works depicting Grimsby in the Second World War, lived there from 1932 until the 1960s. Akureyri, Iceland. In 2007, a friendship and fisheries agreement was signed with Akureyri which according to Ice News, might lead to a twin cities designation in the future. As a port with extensive trading ties to Continental Europe, the Nordic nations and Baltic Europe, the town plays host to honorary consulates of Denmark, Iceland, and Norway. Swedish and Finnish honorary consulates are located in Immingham, and that of Germany at Barrow-upon-Humber. The people of Norway send a tree to the town of Grimsby every Christmas since the end of the Second World War. The Norwegian city of Trondheim sent a tree for 40 years until 2003, since then the tree has been donated by the northern Norwegian town of Sortland, and placed in the town's Riverhead Square. During redevelopment of Riverhead Square the tree has been placed in the Old Market Place since 2013. Grimsby class sloops, in service from the 1930s until 1966. ^ "The view from Grimsby". The Economist. 25 April 2015. Retrieved 11 December 2015. ^ Middleton, Alan (January 2013). "Grimsby's Fishing Heritage". Lincolnshire Life. Retrieved 11 December 2015. ^ a b "Great Grimsby Day". BBC. Retrieved 22 January 2008. ^ "Scunthorpe United midfielder Matt Sparrow tweets 'codheads' jibe ahead of FA Cup showdown with Grimsby Town". 29 October 2013. Archived from the original on 21 August 2014. Retrieved 20 August 2014. ^ "'Codheads' and non-league opposition – FA Cup banter begins ahead of Scunthorpe United's date with Grimsby Town". Scunthorpe Telegraph. 28 October 2013. Archived from the original on 22 August 2014. Retrieved 20 August 2014. ^ Riach, James (8 November 2013). "FA Cup first round: Grimsby face bitter rivals... live on al-Jazeera". The Guardian. Retrieved 20 August 2014. ^ Parrot, John (15 July 2014). "Grimsby, grimness and Penelope Cruz". hefilmreview.com. Retrieved 20 August 2014. ^ Top 10 of Britain. Hamlyn. 2009. British Demonyms. ISBN 978-0-60062-251-2. ^ http://www.citypopulation.de/php/uk-england-yorkshireandthehumber.php?cityid=E35001320 – City Population. Retrieved 10 December 2014. ^ "Grim's legend stands firm as historic tale". Grimsby Telegraph. 30 December 2008. Archived from the original on 25 May 2012. Retrieved 16 November 2014. ^ Shaw, George (November 2010). Old Grimsby. Wellowgate Publications Ltd. p. 136. ISBN 978-1-4092-3671-9. Retrieved 6 June 2013. ^ "Honour our heroes of the ocean". Grimsby Telegraph. Archived from the original on 22 April 2013. Retrieved 17 November 2014. ^ a b c "Grimsby's most horrific night". Grimsby Telegraph. 8 January 2011. Archived from the original on 4 October 2013. Retrieved 4 October 2013. ^ a b c d e "Assessment of the status, development and diversification of fisheries-dependent communities: Grimsby Case study report" (PDF). European Commission. July 2010. Retrieved 10 December 2016. ^ "Grimsby Fish Market". www.grimsbyfishmarket.co.uk. Retrieved 17 March 2011. ^ "PS Lincoln Castle, North East Lincolnshire". www.theheritagetrail.co.uk. Archived from the original on 8 June 2011. Retrieved 26 February 2011. ^ Cooke, Jeremy (23 March 2009). "Grimsby gains from Iceland's woes". BBC News. Retrieved 2 April 2010. ^ Williams, Geoffrey (5 May 2001). "Great drives: The A16 from Stamford to Grimsby and Cleethorpes". The Daily Telegraph. Retrieved 16 November 2014. ^ a b c d Townsend, Mark (26 January 2013). "Environment Fishing How climate change spells disaster for UK fish industry". The Observer. Retrieved 4 July 2013. ^ "Grimsby Ice Factory renovation plans unveiled". BBC News. 24 February 2013. Archived from the original on 2 April 2015. Retrieved 30 March 2015. ^ "Grimsby nets a 'pizza' the action", BBC News. Retrieved 9 December 2014. ^ "Youngs Seafood". Retrieved 14 May 2009. ^ "The Grimsby Traditional Fish Smokers Group". gtfsgroup.co.uk. About, Smoking Method. Retrieved 23 September 2010. ^ "Icelandic". Retrieved 17 November 2014. ^ "Five Star Fish :: Passionate About Seafood". Retrieved 17 November 2014. ^ "Humber Seafood Institute". Archived from the original on 22 February 2011. Retrieved 14 May 2009. ^ "The UK's food production capital uncovered". www.foodproductiondaily.com. 7 June 2004. Retrieved 14 May 2009. ^ a b "£4.2m expansion plans unveiled for Grimsby's Freshney Place Shopping centre and Primark – Freshney Place Shopping Center". www.freshneyplace.co.uk. Archived from the original on 21 March 2016. Retrieved 1 April 2016. ^ a b c Bawden, Tom (6 February 2016). "Grimsby 'generating more electricity from renewables than anywhere else in England'". The Independent. Retrieved 19 February 2016. ^ a b "Assessment of the status, development and diversification of fisheries-dependent communities: Grimsby Case study report" (PDF). European Commission. July 2010. Retrieved 10 April 2014. ^ "Locals hit back at Sunday Times columnist AA Gill's assessment of 'dull' Grimsby and 'horror-film empty' Cleethorpes". Grimsby Telegraph. Archived from the original on 24 September 2015. Retrieved 10 December 2016. ^ "Burton Albion 3 – 0 Grimsby". BBC Sport. 7 May 2010. Retrieved 9 December 2014. ^ Garry, Tom (15 May 2016). "Forest Green Rovers 1–3 Grimsby Town". BBC Sport. Retrieved 6 August 2016. ^ "Mariners catch Wembley cup win". BBC Sport. 19 April 1998. Retrieved 9 December 2014. ^ "Grimsby & District Table Tennis League". Archived from the original on 13 April 2007. Retrieved 4 April 2007. ^ "Brewing up a success". Grimsby Telegraph. 10 July 2014. Archived from the original on 10 May 2015. Retrieved 10 May 2015. ^ "Past pubs of the 1960s and 70s". Grimsby Telegraph. 30 December 2014. Archived from the original on 10 May 2015. Retrieved 10 May 2015. ^ "£12m cinema and food complex for Grimsby town centre". Grimsby Telegraph. 24 March 2014. Archived from the original on 25 March 2014. Retrieved 16 May 2016. 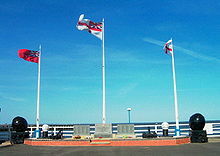 ^ "Fishermen's Memorial, Grimsby". www.hodsonarchitects.com. Archived from the original on 27 August 2008. Retrieved 5 April 2008. ^ "Grimsby Telegraph moves to modern offices in Heritage House". Grimsby Telegraph. 6 October 2015. Archived from the original on 18 October 2015. Retrieved 16 May 2016. ^ Child, Ben (14 July 2014). "Sacha Baron Cohen angers residents of Grimsby and Tilbury". The Guardian. Retrieved 1 April 2016. ^ "Skint in Grimsby watched by more than 1 million viewers". Grimsby Telegraph. 25 November 2014. Archived from the original on 18 May 2015. Retrieved 10 May 2015. ^ "Flood alarms for Anglia". The Engineer website. 28 August 2007. Retrieved 10 May 2015. ^ "Sir Patrick Cormack MP" (PDF). Hull History Centre. Retrieved 25 October 2017. ^ "CANDIDATES". news.bbc.co.uk. BBC News. 2001. Retrieved 25 October 2017. ^ Elliott, David (30 May 2017). "Humberside Police reveal preferred Chief Constable candidate". Scunthorpe Telegraph. Retrieved 14 September 2018. ^ "Ian Huntley: The Soham Murderer". Crime and Investigation. Retrieved 17 November 2014. ^ "Soaps – News – 'Doctors' gains new GP and practice nurse – Digital Spy". Digital Spy. 5 July 2007. Retrieved 17 November 2014. ^ "The England Team Commonwealth Games, Delhi 2010". Sporting Life. Archived from the original on 25 October 2011. Retrieved 21 May 2012. ^ "Ernest Worrall – artist who chronicled Grimsby at war". Grimsby Telegraph. 15 October 2008. Archived from the original on 9 June 2012. Retrieved 11 August 2011. ^ "Fish friendship between Grimsby and Akureyri". IceNews Daily News. 19 September 2007. Retrieved 4 July 2013. ^ "Grimsby & Immingham". ABP Ports. Retrieved 4 July 2013. ^ "Danish Consulates and Vice-Consulates in the UK". Ministry of Foreign Affairs of Denmark. Retrieved 4 July 2013. ^ "Consulates". Embassy of Iceland London. Retrieved 4 July 2013. ^ "Consulates in the UK". Norway.org.uk. Retrieved 4 July 2013. ^ "Swedish Consulates". The Embassy of Sweden, United Kingdom. Retrieved 4 July 2013. ^ "Contact information: Honorary Consulate of Finland, Immingham & Grimsby". Embassy of Finland, London. Archived from the original on 27 September 2013. Retrieved 4 July 2013. ^ "Honorary Consuls of the Federal Republic of Germany in the United Kingdom" (PDF). Embassy of the Federal Republic of Germany, London. Retrieved 4 July 2013. ^ "Christmas tree arrives from Norway after six-day trip across North Sea". Grimsby Telegraph. 16 November 2010. Archived from the original on 4 July 2013. Retrieved 4 July 2013. ^ "Christmas arrives in Grimsby as festive tree arrives from Scandinavia". Grimsby Telegraph. 16 November 2011. Archived from the original on 17 November 2011. Retrieved 4 July 2013. ^ "Video: 35ft Christmas tree arrives at Grimsby Docks from Norway bound for the Riverhead". Grimsby Telegraph. 15 November 2012. Archived from the original on 4 July 2013. Retrieved 4 July 2013. ^ "Grimsby-grana på vei". Bladet Vesterålen (in Norwegian). 4 November 2013. Archived from the original on 2 December 2013. Retrieved 26 November 2013. Wikimedia Commons has media related to Grimsby. Wikivoyage has a travel guide for Grimsby. "A Brief History of Grimsby". Retrieved 12 April 2005. "Leslie Aitchison, Lincolnshire Acts of Parliament". Retrieved 12 April 2005. "Great Grimsby Day". BBC. Retrieved 22 January 2008.